Looking for the Best Trading Podcasts for 2015? Well, you’ve come to the right spot. Whether you’re interested in swing trading, momentum trading or buying earnings breakouts, this blog post has just the right podcast for you. Chat with Traders: This new podcast launched in 2015 is a definite contender for the best trading podcast of 2015. Each week, the host Aaron Fifefield interviews successful, and sometimes legendary, traders to understand why they win consistently. This is an excellent podcast for entry-level traders who are looking to find their footing in the markets. I really enjoy tuning into this trading talk show each week. MarketFoolery: This straight-to-the-point podcast, presented by Motley Fool, is a great way to stay on top of market stories. It’s also sure to expose you to a steady stream of stock trading ideas. And what’s not to love about that? Check out MarketFoolery to get a glimpse into the narratives behind the most popular stocks on Wall Street. Trend Following: Michael Covel is a little bit eccentric, but that’s why I love him. His podcast about trend following trading covers everything from psychology and trading systems to eastern philosophy and interviews with the world’s best trend-following traders. If you’re a serious trend-following you’re probably going to want to make the podcast a regular listen. StockTwits: I couldn’t write a list of 2015’s best trading podcasts without including this must-follow show hosted by Chicago Sean. It’s always worth listening to. He features some of the best traders from the StockTwits community and does a fantastic job connecting with the guests. And you know what the best part of this podcast is? Sean’s interviews are even more educational than they are endearing. Check it out for yourself. Masters in Business: Okay, before we review this final podcast, let me just admit it isn’t exactly a trading podcast. But in this business-oriented broadcast, Barry Ritholtz regularly parades absolutely outstanding guests. And almost all of them talk about the market. You’re sure to learn from every episode of Masters in Business. Now do yourself a favour and start listening. So there you have it, folks! In my opinion, these are the Best Trading Podcasts for 2015! But what do you think? Leave me a note in the comments section below if you have your own favourite trading podcast. I am always looking for more great content to listen to so I’ll look forward to hearing your suggestions. This entry was posted in Stock Ideas and tagged trading podcast on August 18, 2015 by Jworthy. In this book review, I’ll tell you all about The Dark Genius of Wall Street. So that you can decide if this is the right investor biography for you. Sound good? So you might be wondering, how did I come across this book? Well, last summer, a commenter on my YouTube Channel recommended a book about The Epic Life of Cornelius Vanderbilt. In that awesome biography, you meet Jay Gould from the perspective of camp Vanderbilt. And I was intrigued. So naturally, I was curious when I came across this retrospective that portrays Jay Gould starkly different from the villain Vanderbilt’s biographer made him out to be. And in that regard, the book didn’t disappoint. Now let me tell you more about the king of the robber barons. 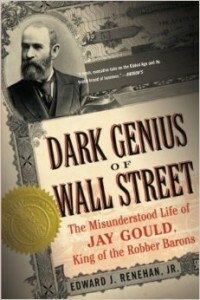 Dark Genius of Wall Street is a biography of Jay Gould. It starts out in the Catskills, where Jay was born. And like any good biography, the book spends a couple of chapters speculating and exploring the influences that may have shaped young Gould in his early years. Since Gould was growing up in the 1800’s, these anecdotes of how he got started in the tannery business were fascinating. From there, the book examines Gould’s early ambitions in business. You see how he got his start, surveying the hills of his county and trying to sell maps. It wasn’t exactly easy going. But Gould’s industrial efforts prevailed. And he managed to snowball his earnings at a rather respectable rate. Eventually Gould moves to Manhattan, and more specifically, Wall Street. From there, he hatches one strategy after the other to methodically build his empire. And this is where the stories really get interesting. From his daring endeavours with Daniel Drew, to his clashes with Carnegie, Gould made an impression on early America. I can’t do the stories justice, so I’ll leave it to you to read more for yourself in The Dark Genius of Wall Street. But first, let me tell you my favourite part. Dark Genius of Wall Street is a really enjoyable read. At around 350 pages, it actually comes in pretty short for a biography. But let me tell you the best part. I think the aspect of this book that I liked best, is that it challenges the conventional perception of Jay Gould. The book does a good job drawing on primary sources and pointing out factual inaccuracies in the accepted folklore about Gould. I appreciated this perspective, because at the same time the author doesn’t hold any illusions about Gould’s true intentions. The reason I like this approach is because it helps you more accurately appreciate the conquests of this epic businessman. Does that make sense? Good. Another reason I like reading biographies is how they often reinforce important lessons. For example, The Dark Genius of Wall Street makes it abundantly clear that by no means did Jay Gould have an easy childhood. He wasn’t spoon-fed success. Instead, he hustled, showed initiative and made things happen for himself. Personally, I always find this to be validating. On a darker note, it’s also insightful to see that almost invariably, the legacies of these one time kings don’t last. In the case of Gould, as in Vanderbilt, their children and grandchildren for the most part squandered their fortunes. It goes to show, you have to work hard to earn it. And that’s the main lesson from these kind of biographies. The Dark Genius of Wall Street was just a particularly exciting one to read about. So by now, you should be getting a good picture of what The Dark Genius of Wall Street is all about, right? Then let’s draw this thing to a close. The Dark Genius of Wall Street is a fascinating financial biography about one of Wall Street’s most mysterious men. For that reason alone, I think it’s worth buying Dark Genius of Wall Street on Amazon. Although if you still aren’t convinced, you’re welcome to watch the video book review below to help you get even more insight into the exceptional read. This entry was posted in Stock Ideas and tagged investment book reviews on August 11, 2015 by Jworthy. This book came on my radar, when the friendly people at FSB Associates recommended it to me. They sent me a copy to read and review. And I’m happy they did. Linda Davis Taylor, is CEO of America’s oldest investment advisory firm, Clifford Swan Investment Counsel. She’s the fourth generation of family running her firm, so I think she’s well-positioned to give advice about how to keep money in the family for the very-long term. Now let me tell you what this finance book is all about. The Business of Family takes an insightful look at an important but little-mentioned topic. The long-term financial success, as well as the overall success of your family is critical to those interested in amassing a fortune. After all, what’s the point of working so hard if your money dies with you? 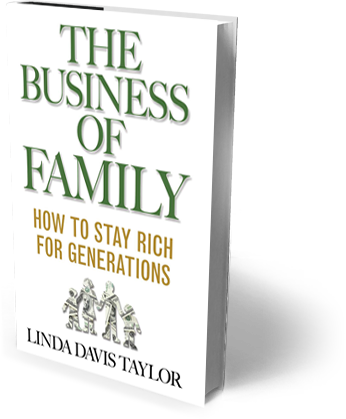 The Business of Family looks at the issues of family, legacy and finance from a new angle. 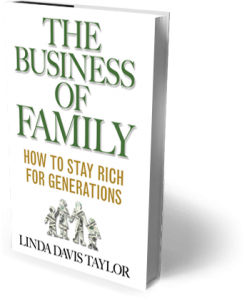 By evaluating industry research, profiling well-known successful family businesses and applying a little book of common sense, this book promotes a thought-provoking approach to managing your family. Emphasis on managing. I was pleasantly surprised at how the author advocates using business best-practice to improve the life of your loved ones. When you read The Business of Family you’ll learn the importance of applying focus and discipline to your home life, just as you would a financial investment. Your business mindset can actually improve your family time. But you’ll have to read this book for yourself to find out how. The bottom line is, when you reflect on the lessons in this book, they all make sense. As with anything, the challenge will be in applying these lessons consistently. So if you can pull it off, a new level of fulfillment might await you. The Business of Family takes a neat twist on something that most financial professionals probably don’t often think about. For that reason, I wanted to give you one quick word of warning about this book. The truth is, a lot of bankers, brokers and traders work hard, and might not to get spend as much time with their family as they like. So admitting to and addressing the challenge head-on might be tough to come to grips with. Ironically, those are some of the people that could probably benefit most from this book, lest they hustle so hard for naught. This entry was posted in Stock Ideas and tagged investment book reviews on August 6, 2015 by Jworthy.